Campaigners are calling for more legislation to cut the number of adult smokers in Wales as figures reveal a fall of just 1% in six years. Action on Smoking and Health (ASH) said the Welsh government must take "bold action" in light of the Welsh Health Survey figures. 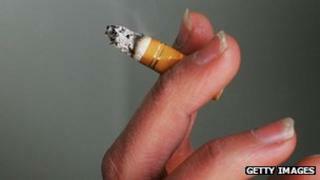 It showed 23% of people still lit-up despite the 2007 ban on smoking in enclosed public spaces. The Welsh government admitted it needed to do more to cut smoking by adults. Elen de Lacy, chief executive of ASH in Wales, said: "The Welsh government needs to look at banning smoking in cars and around children. "We need to be thinking about packaging to stop young people being attracted to smoking. "The Welsh government needs to be taking bold action." The survey showed Wales' smoking rate had remained static since 2010, and had fallen by only 3% since 2003-2004. But Ms De Lacy added: "The ban never set out to reduce smoking rates but the aim was to reduce exposure to second-hand smoke. "It has been successful in what it set out to do but it has not had the knock-on effect." Health campaigners called into question the work of the Welsh government in its attempts to meet its target to reduce smoking prevalence to 16% by 2020. Ms De Lacy blamed the Welsh government's "ambitious" targets and poor investment in public health campaigns on the issue. She said: "The Welsh government has set an ambitious target of 16% smoking prevalence by 2020 and it is hard to see how we are going to reach this target if things remain the same in Wales. "We need to be investing in comprehensive quit smoking campaigns, delivering more flexible cessation services and tackling illicit tobacco in our communities." A Welsh government spokesperson said it had made "good progress" in cutting smoking among young people but it needed to do more to reduce the number of adults who smoked. Its programme, Tobacco Control Action Plan, had set targets of no more than 20% of adults smoking by 2016 and 16% by 2020. The spokesman said: "There is compelling evidence that the most effective approach to tobacco control is a comprehensive strategy combining legislation, high taxation, regulation of advertising and sales, restrictions on smoking in public places, and a tailored range of awareness, education and cessation initiatives. The Tobacco Control Action Plan incorporates all of these approaches. "If we are to change attitudes and smoking behaviour in order to meet our targets then we all need to work together to promote a positive smoke-free approach." The Welsh Health Survey also revealed adults in Wales are getting fatter, with three in five adults being overweight or obese. Just 29% reported being physically active on five or more days in the past week, and 33% reported eating five or more portions of fruit and vegetables the previous day. More than a third (34%) of children were classified as overweight or obese - a slight fall from 35% in 2011 - but the number classed as obese remained at 19%. A Welsh government spokesman said the figures for children were "more encouraging" but acknowledged the rise in adult overweight and obesity rates. He added: "Programmes such as the Community Food Co-operative Programme and Change4life campaign form part of our broader response to helping people take personal responsibility for their own health by achieving and maintaining a healthy body weight, eating well and becoming physically active."